what I saw as I turned my head and looked backwards. Burning in the distance like a star in space. you would have seen how people were pouring out of her. rolling out of a broken jar. to all of those who escaped on time. The city is burning, and we are standing all around. The city is being gangbanged, and we are watching. By now she’s probably dead. you will always remain dead within her. Like a dead fetus within a belly. How long will a fetus stay alive once its mother is already dead? Fully alive within a dead body. On the housetops, and in the prophecy. This moment, when we turn back our heads for one last time. but the head is turning back. we will open our lament. wipe your tears, dear audience. Don’t cry for us tonight. put your hands please under your underwear. Relocating to germany on 2012, I was introduced to an unfamiliar position in society: the position of (in best case) being not very needed in it and (in worse case) unwanted in it. For a couple of years, in this twilight zone of the adaptation period to the new place, let’s say that … I had almost nothing in my calendar. I woke up, everyday, into an empty from plans day. I felt like a retired person, like a person who left everything behind. No schedule, no meetings, nothing to look forward to. For a couple of years, I have basically woken up every day into a world that has forgotten all about me. The only concrete thing to do was to take care of my private, basic needs: cooking, showering, doing my laundry, eating. These missions created a daily routine. I had to go somewhere (to the supermarket/ the drugs store) in order to take care of some things. Everyday, I accomplished one mission, only the “urgent” one for this specific day. The reason was not only my difficult economic situation in the first few years of living in Germany, but the deep need that I had in a TASK. “Today I need to buy a shampoo? Great – I will look for the most appropriate one during the (whole) afternoon. Tomorrow I can take care of the salt”. Every day needed a task, a reason to leave the house, to move. it sometimes felt like I’ve died. The longer I was walking there, in the cheap shopping-centers of Neukölln, the neighbourhood in Berlin where I live, the more details I saw. Quite quickly I could distinguish between the “real” people – those who are “anchored” in life, those who have an actual reality – and the “retired” people, the ghosts. Everyday I discovered tens of people around me – who were hovering, exactly like i did, two centimeters, maybe a little bit less, above the ground; unconnected to the place, out of any social structure, out of any context. Every day they were there. Every day I was there. Most of society won’t notice our hovering, most of society runs forward, rushes and hurries from one meeting to another, from one mission to another, and has no time, capacity, or interest to recognize what happened to us – so called ordinary bodies, but nothing under our feet. Floating. Two centimeters, maybe a little bit less, above the ground. We were hovering close to the walls, in front of the shops display windows, up and down the electric stairs, sometimes taking a rest on the massage armchairs, being kicked from them when someone actually really wanted to throw a coin and get a massage. Hovering further, taking another round, although nothing was waiting for us; trying to hide the unfocused look in our eyes, the destinyless path of our day, our day that circled itself like a lost, confused dog. I never spoke with almost any of the other hoverers. In Öziri’s words: we were not friends, but we were reflections of each other, we were sisters. Strolling parallely, trying to behave as if we were waiting for someone, waiting for something, because you know, just strolling by your own in the same area for too long will look suspicious in a hasty, capitalistic city. And indeed, four cops were steadily there: morning shift, afternoon shift and evening shift, following us with their eyes. They are trained with racial-profiling and aren’t hiding it. A certain appearance + a certain behavior will drag their attention, at some point they will approach and ask for a passport. So pretending busy: checking all the items in all the clothes stores (in which we will never be able to buy anything), looking at all the business-lunches in all the menus (from which we could never afford anything), watching groups of friends coming and going (no friends yet in this foreign land for us), no opportunities, no future. Some of us lost hope and you could see it. Some of us still believed that it’s a phase, and something might come and you could see it. In all ages we were, from everywhere in the world, sharing this basic hopelessness to be ever accepted and invited to give our perspective or contribution to this society in which we live. In all ages, from everywhere in the world, being constantly, wordlessly but again constantly reminded and informed that no one was waiting for us here, in this place to which we willingly immigrated, or to which we, by no other choice, had to flee. The world in general – discovers the relocator or the displaced person – keeps on existing after she or he is gone. And during those endless hours on the social bench in this tiny, forgotten shopping mall – tens of hovering people are being confronted with their own temporality. The place that they left, actually didn’t really need them in order to keep on existing, it existed with them and it will exist without them. In the place they arrived to, “unnecessary” is an understatement. whether staying or leaving, they will – in most of the cases – remain transparent. “All over the world we were scattered. In your streets, in your governmental offices, in your news. a whole new world of work opportunities for your social workers. You are dealing with our problem, day after day, no doubt about that. These never ending years of hovering have finally so called “ended” for me. A toe, and another toe – with a bit luck, and not a small amount of privilege – I found my way back to the ground. But the ground didn’t feel the same anymore. it was not the same ground on which I used to walk before my relocation. The result: Theatre directing, that was my main professional activity for 15 years of hard, endless work, just felt meaningless to me. I gradually started to lose interest. Thinking about it, theatre directing – the mastership of time and space, was somehow no longer fitting my position in this society I was still trying to adapt myself to. I was maybe not circling a shopping center anymore, but still felt like behind a glass wall. The performative and political “here and now” that are the theatre director’s first tools – were still far away from me. I was not here and now. I was 3,000 Kilometers away from Jerusalem, the burning city where I was born and raised. I was 3,000 Kilometers away from the bombarded Gaza during the summer of 2014 as well as today, the 27th of March, when Gaza is under attack again by the government that claims to represent Israel, and was bombarded during the night, again, while I was quietly sleeping here in my bed in Europe. Endless kilometers from my past. And these stubborn few tiny micro millimeters that kept me, always a bit, always a little bit above the ground. How could I direct without a ground? how could I direct for this audience here, who I don’t really know, or even worse, whom I don’t really understand? I am being more and more invited to represent a perspective. Which one? Well: the “Jew”, the “Israeli”, the “Woman”. So I was “invited” into the german society – but basically into a well designed role – a role that many have filled before me: the role of the jew, the role of the feminist, the role of the Israeli. What does it really mean: I was still transparent. What can one do then? When one feels transparent, unseen. When one feels groundless, language-less, and nameless? By being disconnected from my first language, the hebrew, I lost my fluency. The easiness. the doubtlessness. I became less secure, more fragile, alerted to my own mistakes, more cautious, a bit more humble. I started to speak less and think more before I release a statement. I started to observe longer before I give a descriptive word. I would say that I became a writer. The first retirement years, the years of staring at this wall or ceiling of the german society, gave me a different point of view and sent me to the writing desk. I observed the German society through the eyes of four policemen that were not there to protect ME, but to protect FROM ME and from the futureless sisters and brothers that were hovering there by my side. I have met the German society from Öziri’s bench, from the hopeless, transparent and opportunity-less position under the white cop’s eyes, and not through fancy Theatre receptions and through the smiling colleagues that handed me a glass of champagne (but still gave the “oh, I love israel, what a great place!” monologue). Here is where we meet. so that it will work. tonight we will sell here all our abandoned belongings. All the things that we left behind when we left the city. And no illusions – we are selling it with tears. I write in english, which was never my main language; in English, with whom I sometimes experience very difficult days. By choosing to write with the language I don’t always control, I feel that I am insisting on connection with this transparent, language-less, nameless starting position in Germany, a position I am always in danger to forget. It reminds me what I’m looking for in my writing. It reminds me that it’s the broken that I’m looking for, and not the “correct”. It’s the question that I am searching, and not the “ right answer”. I just know that I prefer entering a room, an encounter or a written text with a stutter. And write my way through the gap. I heard that in Finland, in similar to Deutschland, the Theatre was used, among others, to popularize the high-language by the audience, and as a means to teach and assimilate it to the local population. So at least in germany of the 19h century, the Theatre was the classroom, the poet was the teacher, the action – “education”. By putting ourselves – the stutterers, the hoverers – on stage and telling our stories, we make a declaration concerning contemporary language, contemporary storytelling and the politics of stage and Theatre. If the Theatre, “the classroom”, invites the stutterer to teach, it might indicate the will of society to unlearn. Unlearn what? Unlearn the “we”, for example. Unlearn the high-language as an identity. This unlearning will change the Author’s status as well. When the focus moves to the poetry that stutters, and to the collection of voices, to collectivity and solidarity rather than to the singular genius voice – the idea of fans and masters, of students and teachers will have to fall apart. Unlearning the hero. Dear Audience. I want to thank you very much for your listening, thank you for inviting me. I thank the Finnish Theatre for hosting, Tinfo, and Hanna Helavouri, Teksti and Hinriikka Lindquiz, Saara Rautavuoma, and Emmy Karhu for organizing it all. Thank you Sinna Virtanen for translating “DADDY LOVES YOU” into finnish. And please suspect. Suspect every “teacher”, every preacher. Especially the one who claims to “know”. They speak too long, all of them, for too many years, too long, and hey, suspect me too, please do, the 20 minutes that I have received for this talk have probably passed a few minutes ago and you know how it is, once you feel good on stage, you can never have enough of your own voice. Suspect. Suspect these words, suspect this talk. This is a call to enter the classroom, enter the Theatre: “DADDY LOVES YOU”! Suspect this class room. Always suspect. Thank you very much. Sivan Ben Yishai, born on 1978 in Tel Aviv, studied writing and directing in the Tel Aviv University. Since 2012 she lives in Berlin und works as a free author and a guest lecturer in the Berlin University of the arts. On 2017, her piece “Your very own double crisis club”, the first part in her Tetralogy “Let the blood come out to show them” was invited to the Autorentheatertagen Festival in Deutsches Theater Berlin and was premiered there, the three other parts of the Tetralogy were commissioned and premiered by Maxim Gorki Theater Berlin. 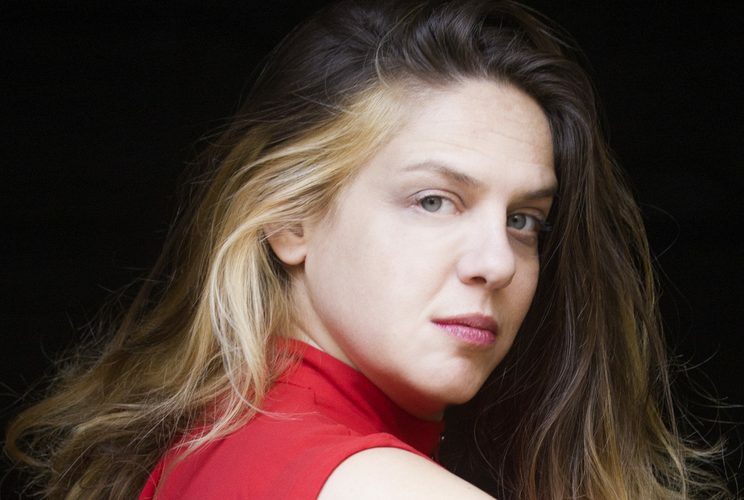 In season 2019/20 Sivan Ben Yishai will be the house author of the national theatre in Mannheim.